The next social psychology principle we’ll focus on with respect to its application to email marketing is the principle of authority. The principle of authority is incredibly powerful, as it sways users to comply to those in power. If you’re new to this series, we recommend starting at the beginning of our user experience and email marketing series, at article one. Starting at the beginning will give you more context as to where authority, the fifth principle of persuasion, came from. We follow and react to authority symbols. Follow along as we show how the principle of authority can be applied to email design. This includes providing context as to what the principle of authority is, how it’s been proven over the years, what email examples support the principle, and how you can leverage it within your email campaigns. The principle of authority is incredibly powerful. It’s based on the premise that authoritative figures inflict the power of persuasion onto users. Taking a step back, when looking at it from a high-level view, this principle seems intuitively obvious. As an example, think of your encounters with the CEO of your company, professor, or doctor. In situations when you interact with these individuals of power, you’re faced with an overwhelming feeling of compliance. For instance, if your CEO requests that you give a presentation at your all-staff meeting, you’ll do it. If your professor requires you to submit a 30-page essay for your final grade, you’ll turn it in. And if your doctor recommends that you cut chocolate out of your diet, you’ll comply. Even if giving a presentation, turning in a 30-page essay, or cutting chocolate out of your diet seems undesirable, most individuals will complete the task at hand. This obligation stems from the social psychological principle of authority. Over the years, many experiments and studies have been conducted in order to prove the effectiveness of the principle of authority. For the purpose of this article, we’ll focus on two main studies which include the Milgram experiment and the parking meter study. The first study we’ll cover is the Milgram experiment, a popular experiment that shows how far ordinary people will go under the command of an authoritative figure. The study was done years ago and was conducted by a professor named Stanley Milgram. The experiment was done with two participants. One participant was a confederate, or an individual that was in collaboration with the experimenter, and the other was an unbiased participant. The unbiased participant did not know that the other participant was a confederate. Once both individuals arrived, the experimenter would inform the two participants that one of them was going to be the student and the other was going to be the teacher in the following scenario. The experimenter would then make it seem as though it was randomly selected, however, in all situations the true participant was selected to be the teacher. The teacher, or the true participant, was instructed to sit in a room. In that room, the teacher could hear what was happening on the other side of the wall. There, on the other side of the wall, sat the student, or the confederate. It’s important to note that the teacher could not see the student. The experimenter informed both participants that the study was on how punishment affects learning and memory. Therefore, the student would have the task of learning a pair of words on a long list until each pair can be recalled perfectly. The teacher, or true participant, would have the assignment of testing the student. If the student answered correctly, they’d move onto the next questions. Yet, if the student answered incorrectly, the teacher was instructed by the experimenter to deliver increasingly strong electric shocks for every mistake. The shocks ranged from 15 volts and increased all the way to 450 volts, or what was considered to be fatal. The shocks were fake, but the true participant was not aware of this. The results were shocking. Two-thirds of the observed teachers, or true participants, were willing to deliver as much pain as possible, 450 volts, under the command of the experimenter. Even more surprising, not one of the true participants quit their job as teacher when the student pled for their release. In many cases, the experimenter observed students screaming, begging, and screeching things such as “I don’t feel well” or “I have a heart condition, this really hurts.” Yet, under the command of the experimenter, not one true participant let up. In this scenario, because the teacher believed that the situation was being driven by a highly-authoritative figure (the experimenter wearing a white jacket) they were willing to go to incredible lengths. This shows how dangerously enticing the principle of authority is, proving how much more effective it can make your email campaigns. The next study that was conducted on the social psychological principle of authority was the parking meter study. This study was administrated by social psychologist Leonard Bickman. The study was a part of a series of studies, where Bickman observed how authoritative figures in uniforms affected the compliance of various individuals. In the parking meter example, he asked random pedestrians on the street to put money in a stranger’s expired parking meter. The parking meter was around fifty feet away from the individual and the corresponding car parked in the spot did not belong to the pedestrian or the experimenter. Bickman conducted the study in two different variations, each with a slight change. In the first scenario, Bickman would ask pedestrians to put money in a parking meter while he was request dressed in average clothes. Whereas, in the second situation, the experimenter requested the same task, yet wore a police uniform. The results showed that nearly all the pedestrians complied with the task while the experimenter was wearing the authoritative uniform. In contrast, fewer than half did so while he was dressed normally. This study proves the power of a uniform and also gives an indication of how difficult it can be to resist requests that come from authoritative figures. Next, we’ll move onto the support of the principle of authority. Within this section, we’ll cover three example of authority in email design. 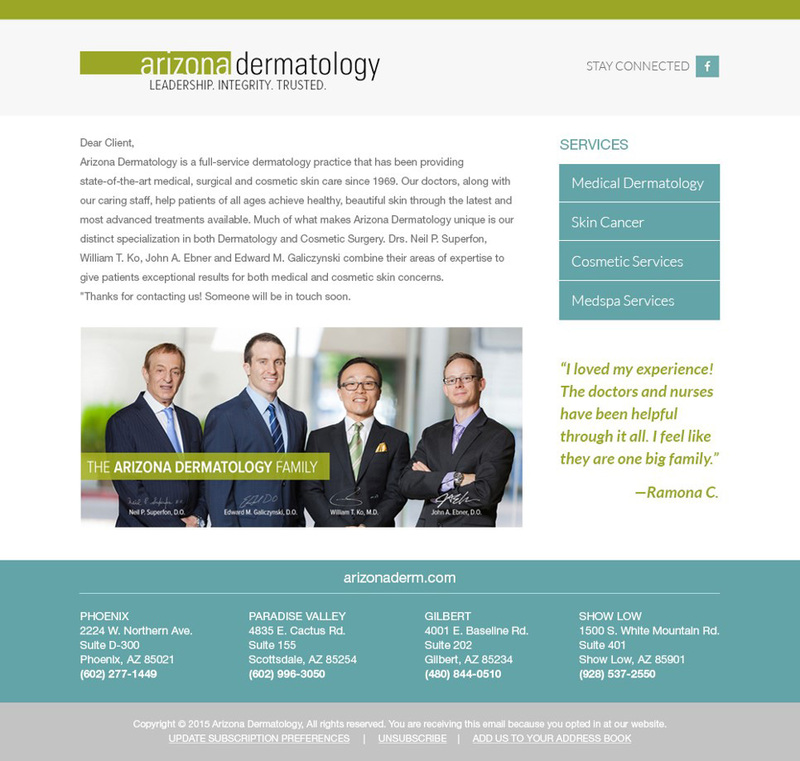 The first email example we’re providing for the principle of authority is by Arizona Dermatology. Arizona Dermatology, a client of ours, is a chain of full-service dermatology clinics located in Arizona. We wanted to feature this email because it provides a clear example of how you can use authoritative imagery within your email campaigns. Specifically, we’ll focus on the image featured at the bottom of the below email. This image pictures all the doctors from Arizona Dermatology in well-tailored suits. The image helps to instill authority because doctors are typically viewed as high-ranked individuals. But more than that, the image also leverages the principle of authority through the clothing and appearance of the doctors. In psychology, clothing and appearance are elements that can trigger compliance within many users. Additionally, finely styled and expensive clothes carry an aura of status and position. This is why, when developing this specific email, we chose to feature the doctors in tailored, stylish, and professional business suits. Their appearance establishes them as authoritative figures and works create a persuasive email campaign. Keep in mind, this tactic works well with any sort of uniform. For example, think back to the two supporting studies on the principle of authority, the Milgram experiment and the parking meter study. In both scenarios, participants were more likely to comply to the requester when the requester was clothed in either a lab coat or police uniform. This shows that in almost any situation, uniforms move users to change their behavior and comply to the requested task. This claim is something you can make use of within your email designs. 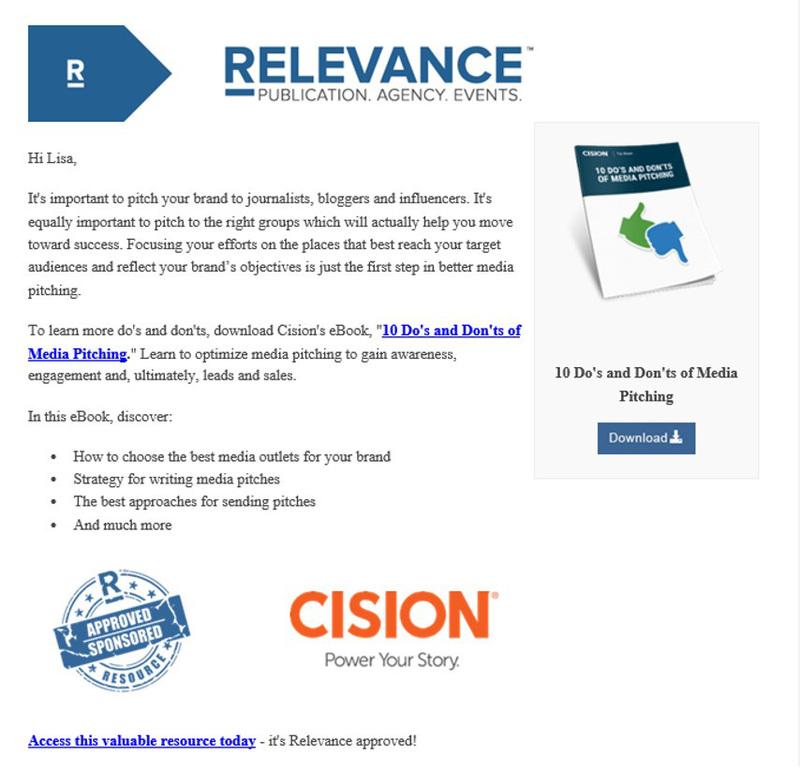 The next email example that features the principle of authority was sent out by Relevance, a digital marketing agency. Specifically, within this email, the agency is promoting an eBook titled, “10 Do’s and Don’ts of Media Pitching.” The email includes a picture of the online book, content that refers to the benefits of downloading “10 Do’s and Don’ts of Media Pitching,” and several logos at the bottom that specify that the eBook is provided by a third-party company, Cision. Out of these elements, the principle of authority can be identified through the logo featured at the bottom left corner of the below email. The logo features the title “approved sponsor” and works to authorize both the online book and the company’s partnership with Cision. Additionally, it’s designed in a way in which it looks like a stamp of approval, which also helps to instill the principle of authority. We wanted to point out this element of the email because the logo has no reflection of any real affiliation or organization. Rather, Relevance created this authoritative logo entirely on their own. This shows that, with good design thinking, any company can take advantage of the principle of authority. You don’t necessarily need large partnerships, high-quality photoshoots, or a celebrity spokesperson to create a persuasive email design. In the previous email, we provided an example of how you can leverage authority through a persuasive logo. But in this example, we’ll share how you can influence your users through persuasive and authoritative content. The company we’re featuring for this example is Goettl, a client of ours that’s well-known as being a trusted plumbing and HVAC (heating, ventilation, and air conditioning) company. To give some background information, for those who are unaware, the plumbing and HVAC industry is incredibly fierce and competitive. There are dozens of competing companies constantly striving to be viewed as the market leader. For example, competitors continuously one-up one another by promising cheaper deals, better customer service, and quicker service calls. Because of this competition, we had to create new opportunities to differentiate Goettl from the competition. One of the ways we were able to do so is by including the principle of authority within our marketing efforts. This principle allowed us to position Goettl as the market leader in ways that the competition couldn’t easily duplicate or one-up. As an example, take a look at the below email. The email is broken up into several different content sections. Each section features a popular myth on the topics of plumbing and HVAC. In addition, below each myth, there’s an additional content section titled, “fact.” The fact section works to debunk each of the provided industry myths. By establishing what is fact and what is myth, Goettl puts themselves in a position of authority. Only an industry leader has the knowledge and experience to dispel common myths. Taking a step back, think about how you can use the principle of authority within your email designs. For example, if you have a customer service team, feature an image of them in their unified polos. If you own a small retail shop, design a logo that shares how your sales team have been certified trained through several rigorous courses. And if you’re involved within the marketing efforts of a large corporation, include authoritative content in order to position the company as market leaders. Then finally, after generating these authoritative elements, take the time to test these elements in order to confirm they’re effective. During this time, a few tweaks may have to be made so that the elements are viewed as most authoritative to your target audience, not just the general public. After taking the time to test and think strategically about the social psychological principle of authority, you’ll begin to create an extremely effective email campaign. Next, follow along as we round up our series on incorporating the principles of persuasion to email design with the sixth and final principle, scarcity. There, we’ll discuss the support behind scarcity and how you can use this principle in order to get your audience to say ‘yes’.